Viewing topic "Downloadable ‘Motif’ videos available direct on Motifator.com"
All the Keyfax downloadable videos--which used to be available only on keyfax.com--are now also available here on Motifator.com. 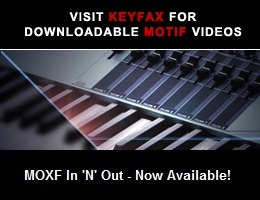 Included are not only all the official and unofficial instrument videos for the Motif XF, MOXF, Motif XS etc but also supporting items like Music Production With Motif, Exploring Sound Reinforcement, and Sound Advice. Additionally, rare items such as the vintage synth feast Analogue Heaven are now downloadable direct from this site. We hope that this will be more convenient for people looking at a range of different items in the Motifator shop. In ‘celebration’ of this admittedly somewhat overdue move, there are new downloadable package deals (Full Motifation Specials) and even a Cyber Monday ‘free-with-every-video-download’ of the Twiddly.Bits Drums Around The World MIDI Loop library.